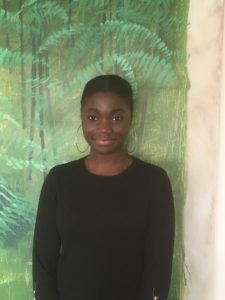 Fatima Ceesay: Volunteering for the Legal Advice Clinic. Next step: Law Degree! I have been volunteering with ISCRE and Suffolk Law Centre since last September – I started on 23rd, I remember the date! I was referred here by Suffolk Refugee Support. I expressed my interest in law, and they suggested I should apply to volunteer here. I mainly help on reception for the weekly Legal Advice Clinic (LAC), doing admin work, putting client’s information on our system and calling them up about their appointments. I enjoy working on reception as I really like meeting a lot of different people, finding out the reasons why they need legal advice. As well, I like working with everyone here and the unity around the office. I’m planning to apply to university next year to do Law, and I’m also trying to apply for legal apprenticeships – so I have both options open to me. A legal apprenticeship would be for six years, working at a law firm – kind of like an internship, but with study as well. From what I’ve read so far, it would be mainly admin work in the first year whilst studying part-time, and then you go onto studying other parts of the law as you are working in the office, helping the solicitors and learning from them. The study would be online, not face-to-face, and then there are assessments to complete, and once you have completed and passed, you can become a trainee solicitor! I’m mainly looking at apprenticeships based in cities – such as London, Manchester, Leeds or Birmingham – as these are the law firms offering apprenticeships. When I’m not volunteering, I like being at home, reading, watching TV – my favourite show is NCIS – I’m into those sorts of crime shows, and it’s still about the law!